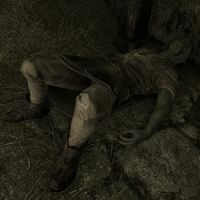 The Pickpocket is a dead Orc found in the Ratway, just across from the entrance to The Ragged Flagon. In life, he found little success as a pickpocket, and began to run out of food and skooma. Rather than resort to eating skeevers, he tamed one called Skritch and trained it to locate food. However, he ultimately died, leaving Skritch trapped in a nearby cage. He is wearing clothes, boots, and a ragged cap, and carries a steel mace. His body can be looted to obtain the Skeever Cage Key, the Pickpocket's Journal, and a modest amount of gold. The key is required for the related quest. This page was last modified on 9 September 2018, at 16:20.